During your research here at the UofG you have access to a plethora of opportunities to develop your research interests. You may even discover entirely new ones! Developing as a researcher doesn’t just relate to the training necessary to progress within your own field, but rather it encompasses wider experience, aptitudes, and transferable skills that you will rely on as you advance as a researcher and crucially, when you complete your thesis and move on to pastures new. While every researcher has different development priorities, this post will share some guidance on those areas that we as researchers in the Arts can all strengthen. What's more Jennifer Boyle, Writing Advisor for Postgraduate Researchers based at the Student Learning Service, offers her advice on developing your writing skills. It is always worth taking some time to assess what you could call your ‘development plan’. Are you confident presenting at conferences or do you struggle with this? Are you better at writing the conference paper than presenting it? This is just about seeing your strengths and how you can improve, because then you can see what practical steps you can take to achieve them. 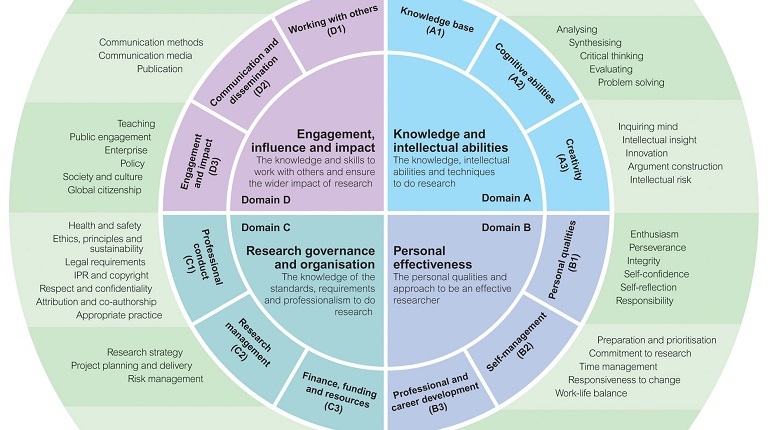 First of all, you should take a good look at the Vitae Researcher Development Framework. The Vitae Framework lists the key areas of development before breaking them down into smaller, easy to understand and much more achievable aims. For example, Domain D of the framework, which is titled Engagement, Influence and Impact, and sounds unhelpfully vague, actually includes manageable outcomes like ‘Teaching’, ‘Publication’ and ‘Mentoring’. Many of these are high on the list of researchers’ interests and priorities during their PhD years. One of the key things about the Vitae Framework is to use it in your own best interests. That is, don’t try to tick everything off the list in three or four years. Instead, do what Vitae themselves suggest and ‘identify your strengths’ before seeking out opportunities to develop them further. Here at UofG that means regularly checking MyCampus for new training courses, or signing up to newsletters from your school and the College of Arts to stay informed about events. One of the most rewarding ways to enhance your development as a researcher in the Arts (and in other colleges) is to get involved in public engagement. If you think it is interesting, then chances are that other people will too. Investigate local libraries, museums and community and heritage centres for opportunities to offer informal talks or demonstrations. Here at the UofG the Insight Talks series regularly seek out short presentations related to the collections held at The Hunterian. Not that you need an excuse to browse the collection, but take a good look and you will usually find something that is related – maybe only distantly – to your research. These types of events strengthen public-speaking skills and allow you to exchange knowledge and ideas with a much wider audience than most researchers get the chance to meet at formal, academic conferences. If you are really keen to build your public engagement experience, then I recommend The Hunterian Associate Programme. This programme requires more commitment since you need to create a small research project, related broadly to your own research, based on an object/objects in the collections within The Hunterian and Special Collections at Glasgow University Library. If heritage isn’t really your thing, but you are keen to get out there and share your research with a wider audience, try the Three Minute Thesis competition or take part in Explorathon which always has lots of opportunities to volunteer and share ideas. Finally, as we focus on our research it can be difficult to appreciate the breadth of valuable experience and skills that we are developing as Arts researchers. Researchers offer project and time-management skills that a multitude of roles require. Every conference paper, published article and informal talk or blog post demonstrates both your communication skills and critical and intellectual abilities. Additionally, whether you were a funded researcher or worked to support yourself, each shows financial management skills in different ways – that’s Vitae’s Domain C3, by the way. And, if you have the opportunity to be a Graduate Teaching Assistant during your PhD remember that while ‘teaching’ might not seem like a transferable skill if you decide to pursue alternative careers to academia, your aptitude for using a variety of communication media is, as is supporting colleagues and working as a team. We can all shy away from assessing ourselves critically but hopefully this post shows that taking the time to recognise our strengths and those areas we can work to improve has its benefits. So get inspired, sign up to one of Jennifer's writing boot camps and share your development plans in the comments below or on Twitter @UofG_PGRblog.